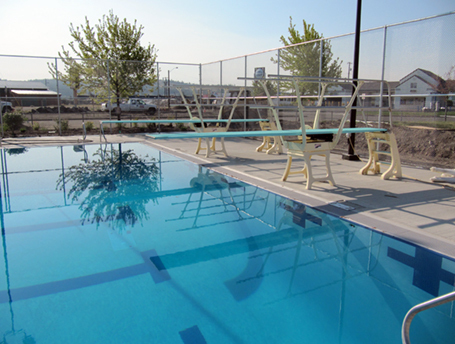 In early 2007, ALSC Architects and Counsilman-Hunsaker teamed to complete the public input design process for the replacement of Hillyard Pool in the eastern region of Spokane. During this input process, the community was very involved and excited about the prospect of a new pool. The families were interactive and forthcoming during the voting on the elements they desired in the new swimming facility, including selecting the waterslides, colors, play structure, vortex, and diving boards. Parks staff (heavily involved in the community meeting process) used neighborhood community centers and libraries to post notices. Throughout, meetings were well attended and community support was evident. In order for the design team to place more of the budget into the water elements, it was decided to remodel the existing bathhouse. This was successfully achieved with the addition of a mechanical equipment area and storage room. With a new roof and the addition of city artwork, the facility is now the local neighborhood gathering spot.